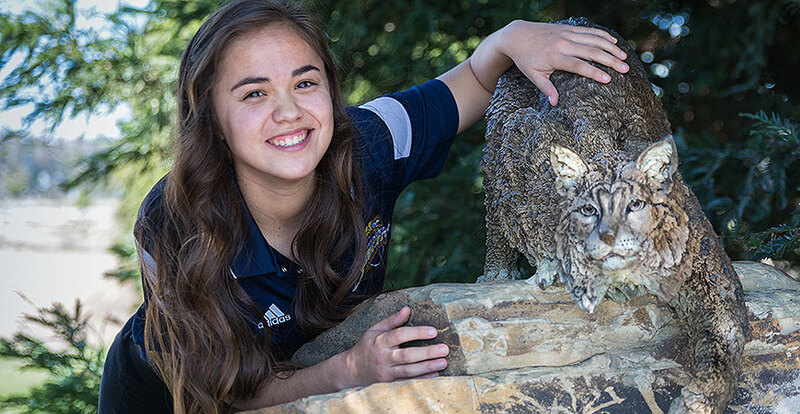 Student-athlete and leader Abbie-Leigh Meneses is preparing to graduate in May with a bachelor’s degree in biological sciences with an emphasis human biology and a minor in anthropology. 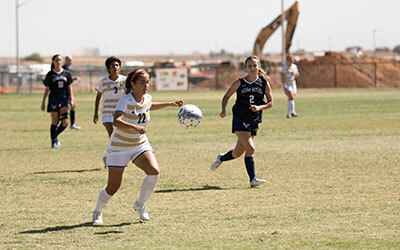 When prospective student-athletes visit UC Merced, soccer standout Abbie-Leigh Meneses is among the first people they meet. Not long ago, Meneses was a recruit herself, touring the University of California’s 10th and newest campus. She fell in love with UC Merced and its central location within driving distance to Yosemite National Park and the San Francisco Bay Area. Now this much-honored student-athlete and leader is preparing to graduate in May with a bachelor’s degree in biological sciences with an emphasis human biology and a minor in anthropology. She plans to enroll in a veterinary program after taking a gap year in Merced to find hands-on opportunities in the field. “I have always loved animals, and I always had pets as a kid,” said Meneses, who adopted a stray cat, Theodore, about a year ago. Meneses, No. 22 on the field, helped the Bobcats to a 43-14-10 record and two conference championship games. Meneses likes to stay busy, juggling academic, leadership and athletic pursuits. The key, she said, is staying organized and working with others who are similarly motivated. Unsurprisingly, Meneses has earned praise for her efforts on and off the field. She has a healthy list of accomplishments including multiple appearances on the dean’s and chancellor’s lists, leadership positions with the Student Athlete Advisory Committee (SAAC) and the Association of Student Athletes, and jobs in the recreation and athletics department. That’s in addition to her key role on the soccer team. Meneses, a midfielder who wore No. 22 all four years on the team, helped the Bobcats to a 43-14-10 record and two conference championship games. This year, she played in all 19 games and tied a career high with three goals. Last fall, Meneses received the National Association of Intercollegiate Athletics' Dr. Leroy Walker Character Award for the California Pacific Conference. The award honors a student-athlete who demonstrates outstanding academic and athletic achievement, campus and community leadership, and future ambition. “She’s just a fantastic kid,” said Hannah Brown, women’s soccer head coach. Brown helped recruit the speedster after watching her play at a Las Vegas showcase. I’m really happy with how I spent my time at UC Merced and that I was able to do all of those things. Meneses has been a positive force on the team and worked hard to polish her skills, her coach said. She’s also the first to help — whether that means giving a teammate a ride, lending a hand with homework or introducing herself to a recruit. Marie Supanich, assistant women’s soccer coach and associate director for Recreation and Athletics, also knows Meneses as president of the SAAC. Meneses takes pride in achievements that extend into the Merced community. As a longtime member and current president of the SAAC, Meneses helped launch a fundraiser that bought Christmas gifts for needy children, participated in a canned food drive that netted roughly 250 pounds of food and collected socks for the homeless. Meneses aimed to broaden the image of student athletes through community service efforts like the sock project. The group tapped into the competitive spirit of UC Merced athletes who bought bulk socks online and repeatedly cleared the shelves of discount stores. More than 2,200 pairs of socks were donated. With commencement fast approaching, Meneses looks back fondly on the experiences she had at UC Merced. “I’m really happy with how I spent my time at UC Merced and that I was able to do all of those things,” Meneses said.